It’s that time of year when we reflect on what we’ve done right and where we could perhaps improve. We look to the New Year with ambitions of being someone better physically, spiritually or emotionally. Resolutions to be a better “you” are often common as we motivate ourselves for the new start. This year, though, I’d like to encourage us to look beyond ourselves and into the world. There is so much hurt and suffering. There are so many people who need the message of love, hope and compassion. And the average American has more wealth than 98% of the world (don’t believe me? click here). We are a blessed nation. So let’s take that to heart this year. This Blog Circle concludes the “Good List” for 2012. Below we’ve selected some amazing organizations, many of which Melanie and I are personally involved. They are run by wonderful people and they are making a very real difference in the world. They reach out to the lost and give them hope. They are on the front lines, fighting to make a difference. I encourage you to take them to heart and spread the world – together we can make 2013 the best yet! Nodding Syndrome is something you’re likely not familiar with. It’s a disease that developed within the past few decades, likely due to the poor living conditions in the refugee camps in Northern Africa. This horrific, neurological disease is impacting hundreds (if not thousands) of children in Uganda. They lose control of their bodies and often lapse into seizures, causing serious harm to themselves. It’s not uncommon for children to fall into open pit fires where their parents are cooking. Many children wander off and never return. The impact on the families is disastrous, and many parents have multiple children who suffer from Nodding Syndrome. Sally Baynton, Co-founder of Hope for Humans, is a dear family friend. She has been doing charitable work in Uganda since 2007. She recently told me about Nodding Syndrome and shared some news articles with me – I was completely heart-broken. These communities are already in poverty, dealing with a broken economy and poor living conditions. They are now faced with this devastating blow as they helplessly watch their children suffer. And going into the farms to work means putting their children at risk. It’s a lose-lose situation. 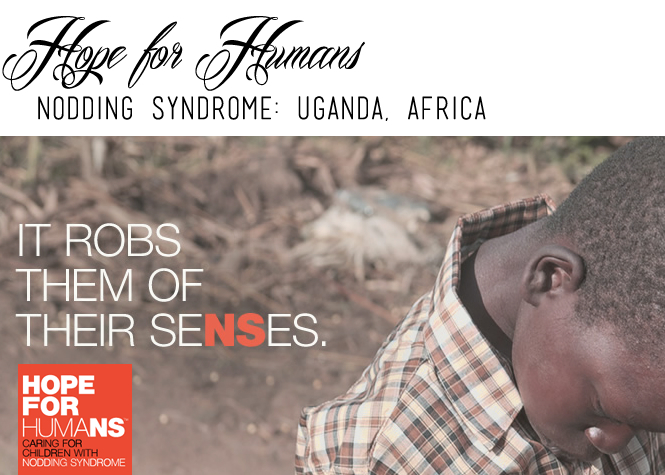 To date, there is no cure for Nodding Syndrome. Help can be provided, though, to assist with the care of these helpless children. Hope for Humans is committed to building Care Centers for these children to receive medical attention and love while their parents work and learn vocational trades. Children, who at one point had to be tied to trees for their own safety, now have a facility to enjoy recreation, medical care, personal hygiene and nutritious meals during the day. Your donation provides medical supplies, transportation for the children and teachers. I encourage you to learn more about Hope for Humans, and how you can assist these families who have already suffered so much. Melanie and I are animal lovers. Actually, that’s a huge understatement – we’d adopt every single animal in every shelter if we had the resources to do so! San Antonio Pets Alive (SAPA) is an organization we support monetarily and physically – Melanie’s beagle “Abbey” was rescued from the EBI list, just hours before her time was set to expire. Our oldest sister, Amy, also has two pups adopted from SAPA. We love this organization and the good it does! 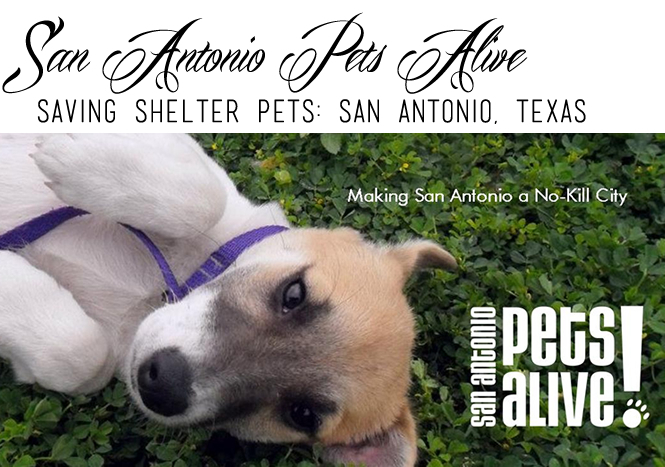 San Antonio has one of the highest shelter kills rates in the United States. The community is not educated about the importance of spay and neuter – hundreds of puppies and kitties are born each day. These animals end up in the shelters or are set loose to survive on their own due to poor ownership. The City of San Antonio has been making efforts to educate and provide low-cost medical care for the community. It’s a slow process, but with organizations like SAPA, precious animals are being saved. In fact, since January 2012, SAPA has rescued more than 5,000 cats and dogs from death. That’s tremendous! To continue their efforts, though, they need help. SAPA exists solely by donation, and is constantly in need of food, treats, litter, towels, blankets and other medical supplies. Their wish list has so many ways you can donate – and monetary donations are always needed. It’s not uncommon for severely injured pups and cats be brought through the door needing immediate surgery. If you’re unable to open your home to a permanent or temporary four-legged child, I encourage you to visit SAPA’s website to learn how you can help. 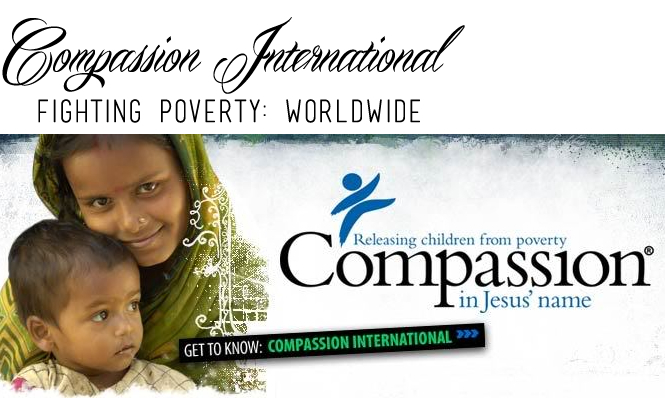 Compassion International is most known for their child sponsorship program. Through this program, children are given education, clothing, medical care and the additional support that their families cannot provide financially. It’s a tremendous organization that’s making a very real impact on hundreds of thousands of children across the world. I have been involved with Compassion International since December 2003. I sponsor a young boy in Haiti named Judelyn – it’s amazing to me that he is now a teenager…he was simply a precious little 5-year-old when he first came into my life. Through Compassion, Judelyn has learned to read and write in addition to studying mathematics and science. Most importantly, though, he has learned about the love and grace of his Savior Jesus Christ. He’s experiencing first hand that his life does mean something, and that people he doesn’t even know are praying for him daily. The Compassion holistic child development model begins with child survival followed by child sponsorship, and ultimately leadership development. The organization strives not only to feed and clothe children, but it aims to release them from poverty by developing them into independent adults who can break from the cycle. More information about Compassion is available on their website where you can learn about their other programs. We take it for granted by swimming in it, making grand fountains out of it and washing our cars with it. Millions of people don’t even have it, though, for its intended purpose: sustenance. Water is meant to give life, but in many countries it is leading to death. When we think of death from illness, we instinctively think of cancer. This is where we are blind to the reality. There are 30,000 deaths that occur every week from unsafe water and unhygienic living conditions, and 90% of those are children under the age of five. Stop and think how many times have you thrown away a water bottle that wasn’t empty. That could have saved lives. “We invite you to put yourself in their shoes. Follow them on their daily journey. Carry 80 pounds of water in yellow fuel cans. Dig with their children in sand for water. Line up at a well and wait eight hours for a turn. 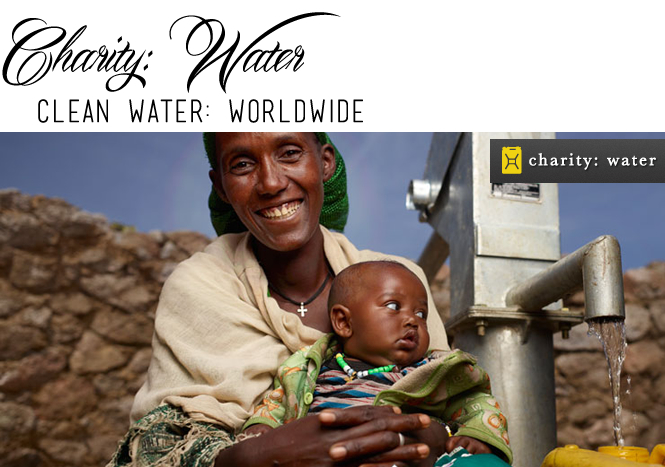 You’re invited to make a difference and give the gift of clean water. Next Up in the Circle: The blog circle isn’t done. Please continue to Petit Lapin where Amanda has some amazing “giving back” gift ideas. I had never heard of Nodding Syndrome. These poor children! It just breaks my heart!